A clutch of airy apartments, most with their own jasmine-scented terraces arranged around a funky pool. If you have any questions or want to enquire about dates, use our form to contact Philippa Jenkins or see their website for more information. Spot the sculpted doves set in a wafer-brick circle above the entrance gate and you know you’re in the right place: Gaucin is on one of the migratory routes between Europe and Africa and all around the village are hand-painted plaques of the birds that stop by. This old olive mill stands in the centre of the delightful bustling village, producing oil until 1967. Subsequently bought by an English artist, it’s now owned by London-based Pip and Clinton, who have created a clutch of airy apartments around a funky heated pool, sheltered by stylish white canvas sails. Six of the apartments have their own terraces (petit Dancaire’s Den does not), brightened by bougainvillea and scented by jasmine, lemons and limes. Reminders of the past – presses, millstones, storage jars – blend serenely with white arches and Moorish décor. Bedrooms vary in size and shape but all are pristine and striking, with good beds, crisp cotton and raw silk. 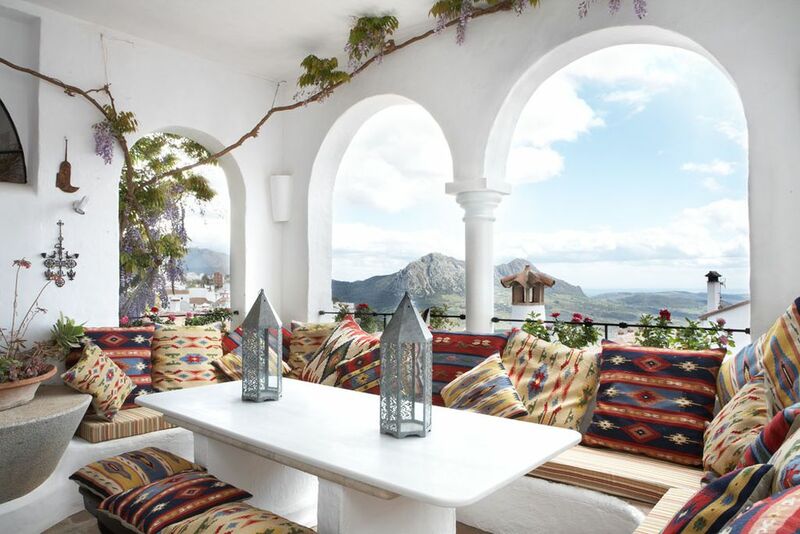 From the mill’s upper terraces you can gaze across the terracotta roofs to the Med and Morocco. We have just returned from a very enjoyable trip to Andalusia where we stayed this beautiful spot in this excellent apartment. Everything you would need was there, plus. The attention to detail, creating a Moorish romantic feel, made the trip so enjoyable. We would highly recommend this apartment and Alan, the owners father, who made us very welcome and gave us very valuable advice on places to visit in the area. Perfect any time of year. Highly recommended. Join our Fiestas:dancing&celebrating for the pilgrimage of Santa Nino+Annual Art Gaucin festival+Ferria in August with flamenco,food&drink stalls+Processions of horses through the village+Traditional BBQs&Paellas+the re-enactment of Napoleon’s invasions! Gaucín has enjoyed a vast and chequered history for such a small town (its current population is around 2 000). The town's history starts in pre-historic times, and cave paintings from this time are still visible in Gaucín today. In and around Gaucín there is a selection of excellent restaurants offering typical Andalusian fare... In the central square of the town, one can sit and drink Tinto de Verano and watch the village go about its business. Walk up the hill to Castillo del Águila, the Roman fort. Inside you'll find the Santo Niño hermitage and the old hospital, with only a few ruins remaining of the latter structure, as well as Arabic fortifications. Visit the San Sebastián church in the village which dates back to 1487 or on the outskirts of the village, a Carmelite convent which was built in the eighteenth century over what used to be the Vera Cruz hermitage. Sunbathe and swim at the beaches of Sabinillas or Sotogrande- only 30 minutes away. Alternatively, get carried away kite-surfing in Tarifa - only one and a half hours away.